The sponge cake must be super fluffy! That makes it easier to roll and – more important – it just tastes so much better. The biggest point you should pay attention to when preparing the batter is that you have to mix it until there are no air bubbles left. This can take a long time, so be patient. 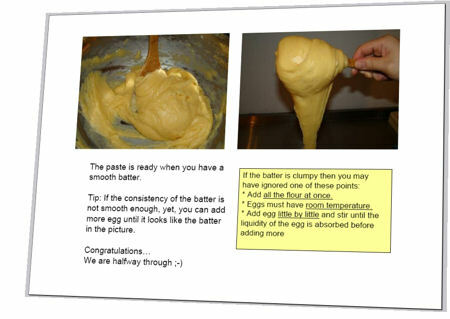 The perfect dough has the consistency of a thick and smooth cream. That’s what you need to make a perfectly fluffy Swiss roll. Another point you should pay attention to is to not overbake the cake in the oven. 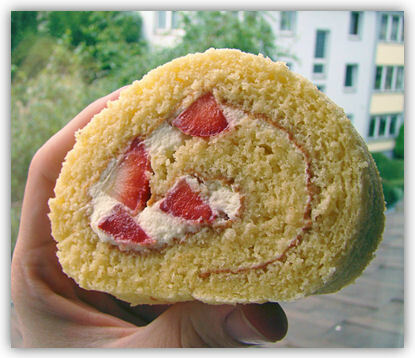 We don’t want a crunchy or dry cake – would make it very difficult to roll. If you want to get the full recipe and a step-by-step e-book with lots of photos about making the Swiss roll, please feel free to join my mailing list. Just enter your name and email in the fields on the right side. 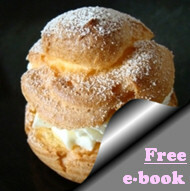 You will get the cream puff e-book immediately and I’ll also send out the Swiss Roll e-book to all my subscribers, soon.